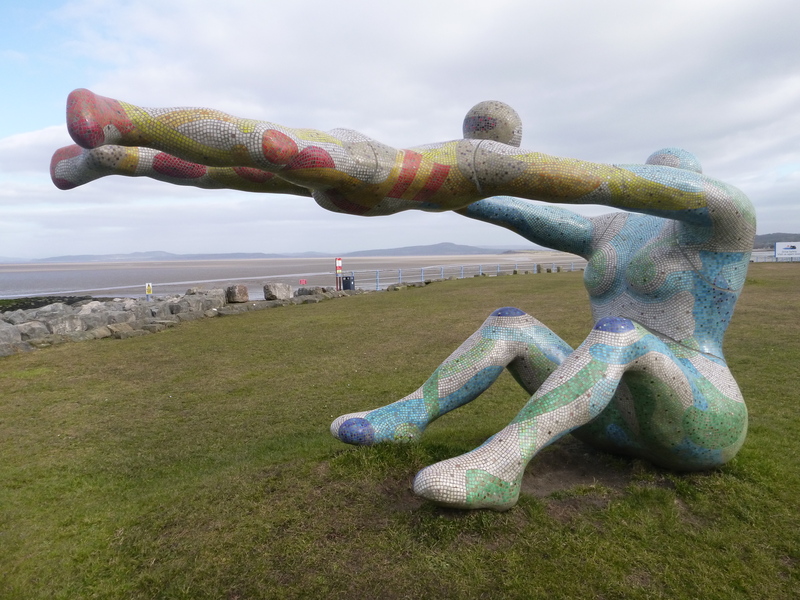 What kind of place is Morecambe prom? 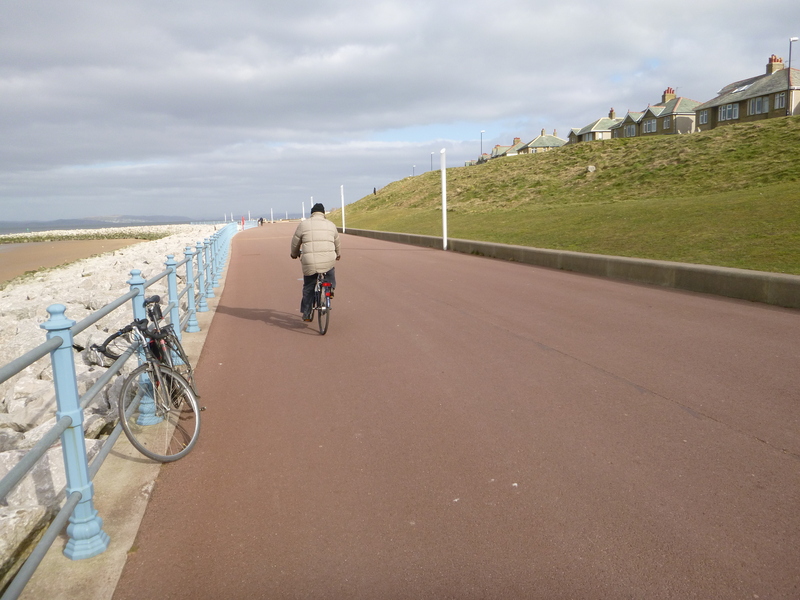 And what does cycling on the prom say about cycling more generally? 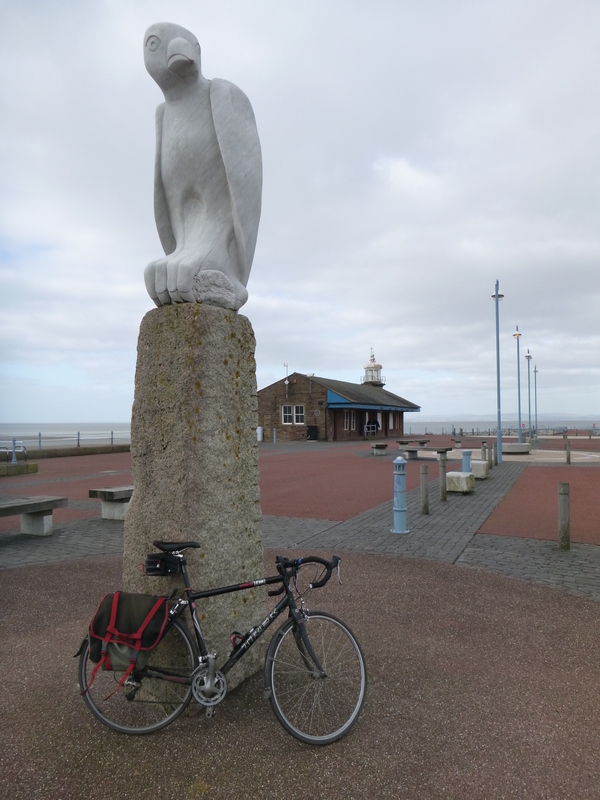 Morecambe prom is between the local and the global, nature and culture; and cycling is a key actor here. 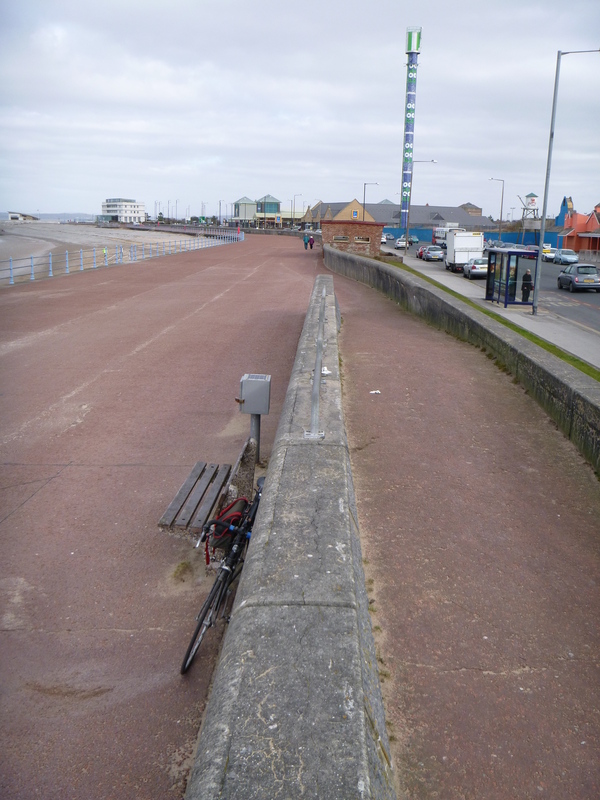 Riding the prom is to trace a boundary. The land to one side and bay to the other keep changing, but your place between them stays constant; you the cyclist the moving point between nature and culture. 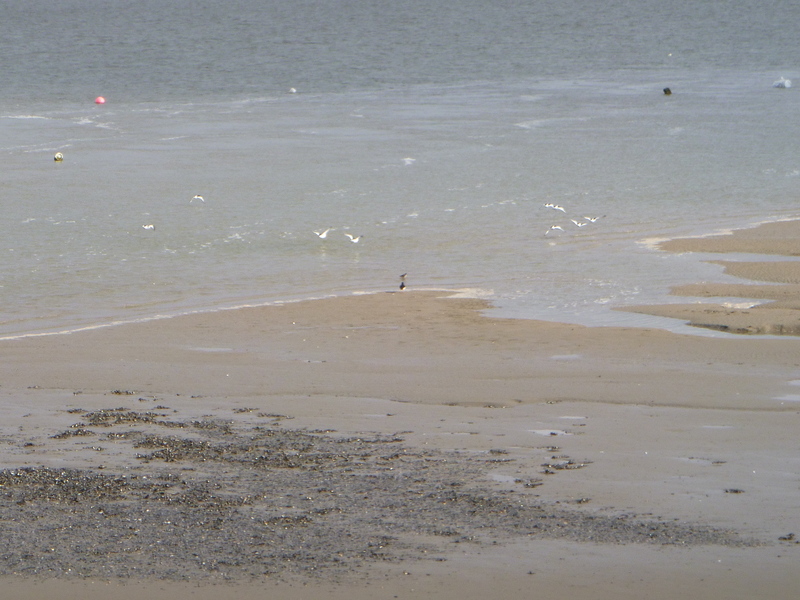 The low steady rumble of traffic is occasionally broken by high-pitched trills of seaside birds feeding on the shore. The wind blows you sideward within metres of buildings full of lives oblivious to the weather. Shoreline smells of salt and seaweed combine with those of buses, chips and bacon butties. You look out towards hills, mud, water and sky, and in towards playgrounds, pubs and streets full of cars. 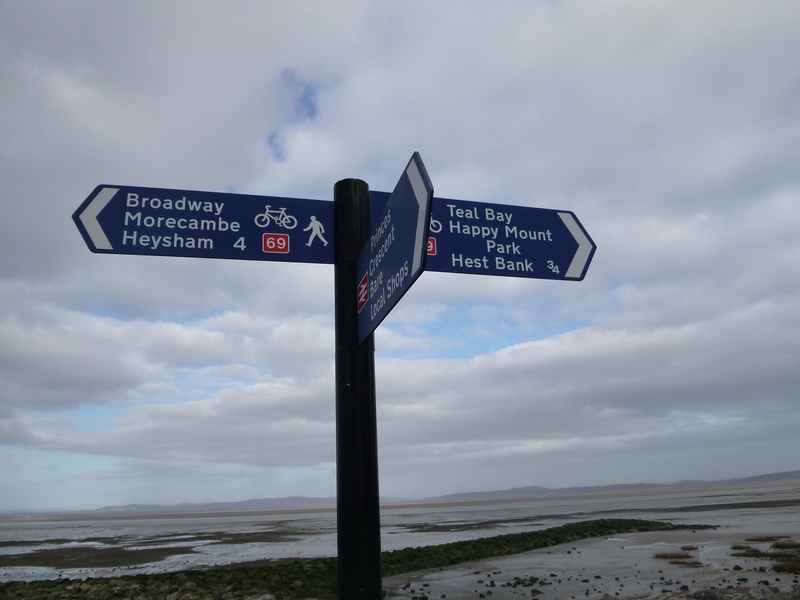 Morecambe’s placed between two identities. Signs of the twin forces of dereliction and regeneration are everywhere. Two of the town’s landmarks are equally but contrastingly symbolic – the Polo Tower stands forlornly waiting for the return of excited kids and candy-floss, the Midland Hotel brings in suited conference delegates by day, and well-heeled migrants from far away for a night or two. Resort towns must make something of themselves, persuade people they’re worth a visit. Morecambe developed from the railway. Among Yorkshire mill-workers it was ‘Bradford-on-Sea’. The town’s newspaper, The Visitor, aimed not at locals but holiday-makers; initially it was published only in summer. Back then everybody wanted a sea view and the town stretched out accommodatingly round the bay. But Britain’s urban industrial workforce melted, and these days people prefer aeroplanes to warmer climes above trains to here. Those who can have abandoned Morecambe for exotic elsewheres, whilst some of those who can’t have moved in, and become trapped. 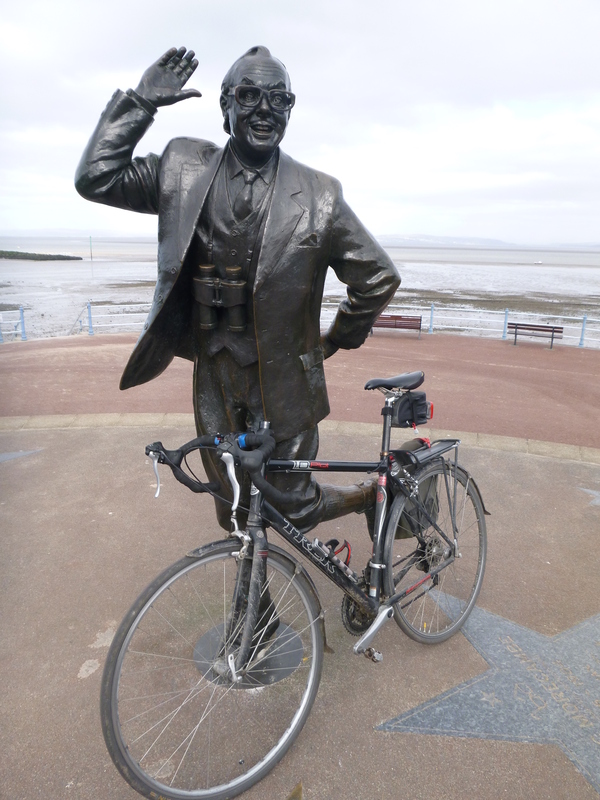 Morecambe’s flat and poor, so shouldn’t cycling prosper here? The town stretches round the bay. Bird life teems across the tidal reach. The views are amazing, sunsets spectacular. Optimistically seen still as a tourist town, regeneration projects aim to develop Morecambe’s ‘USP’, its vantage point, its prom. 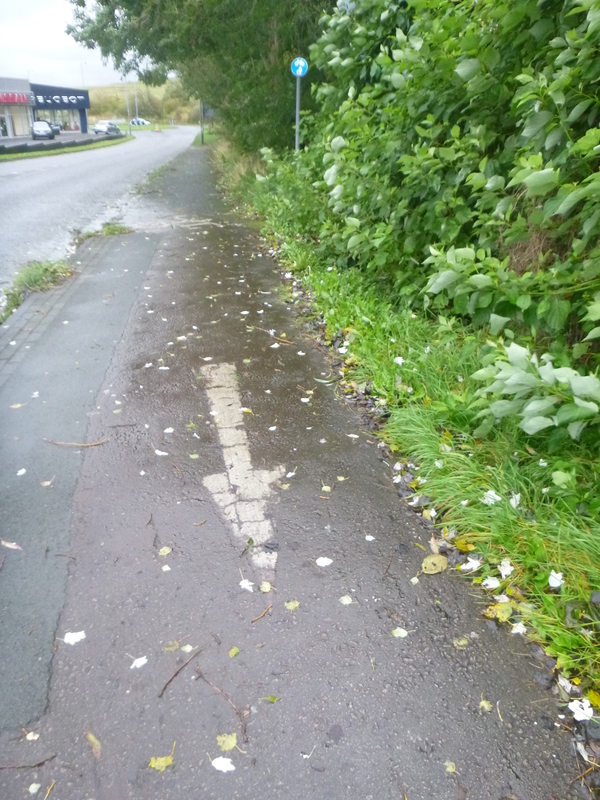 The unfolding panorama afforded by traversing the long, smooth but otherwise marginal promenade makes the bicycle the obvious twenty-first century vehicle choice. 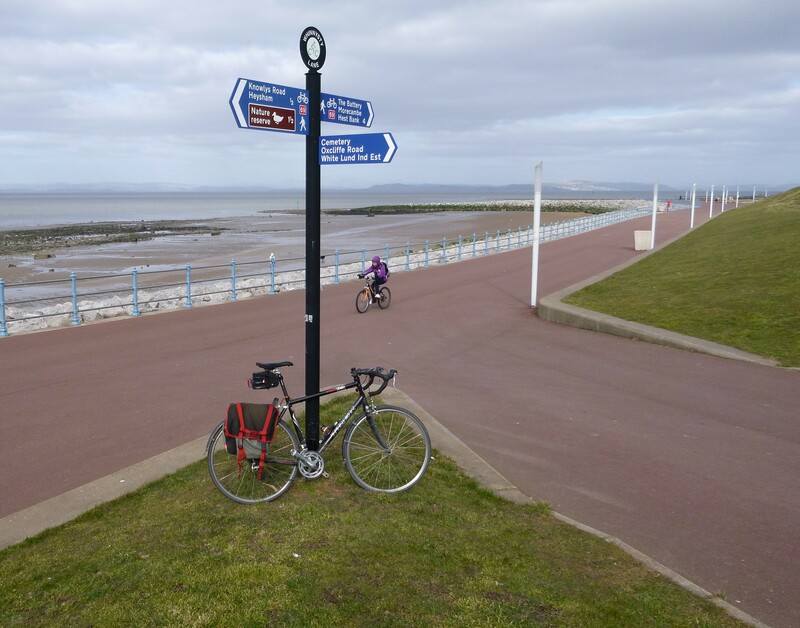 Proms were made for walking but promenading’s a lost art, and these days the prom is made for cycling. Nature and cycling are the regenerative forces for a middle-class culture. 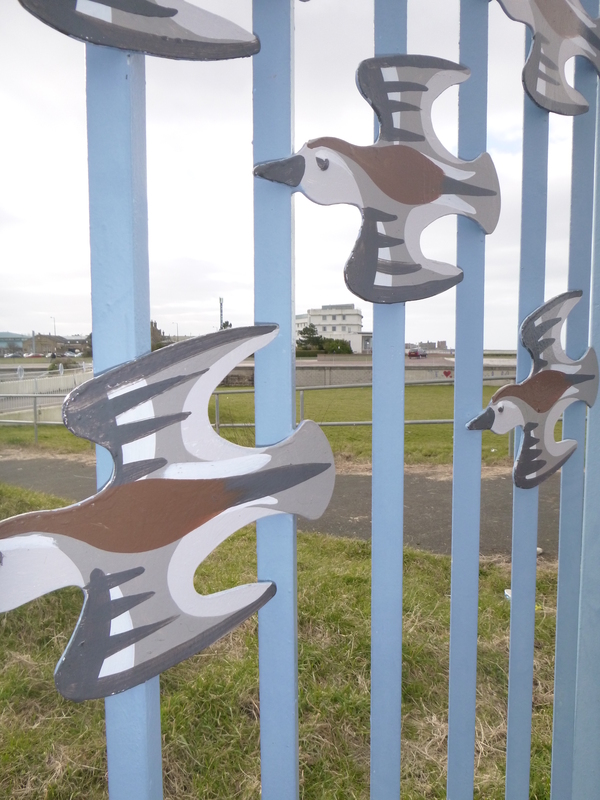 Though they ride the line between the two, people come here in cars to ride their bikes round a bay full of birds, not a town full of problems. 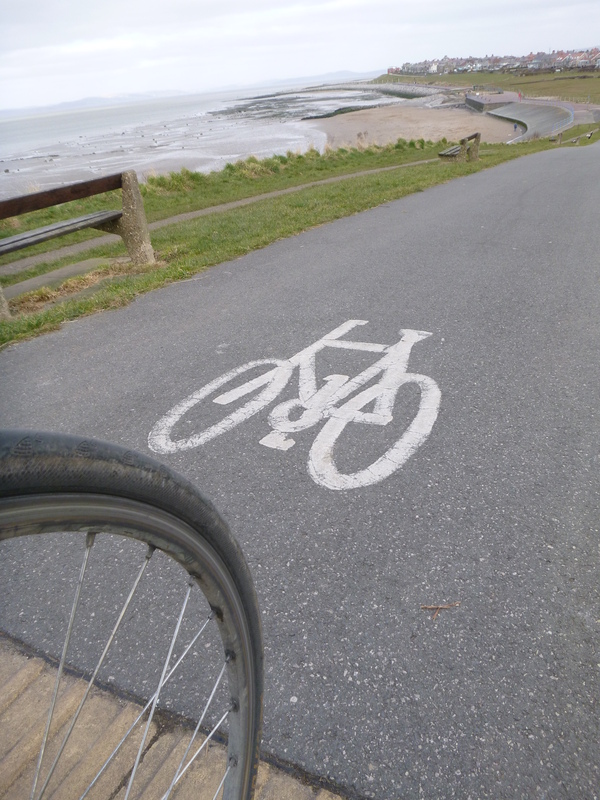 Cyclists on the prom can enjoy the coast and bury their heads in the sand about the problems lying just inland. The prom belongs to the cosmopolitans in whose hands the town’s hopes of regeneration mainly lie, not locals. It’s easy to imagine and construct the prom as a leisure cycling route. 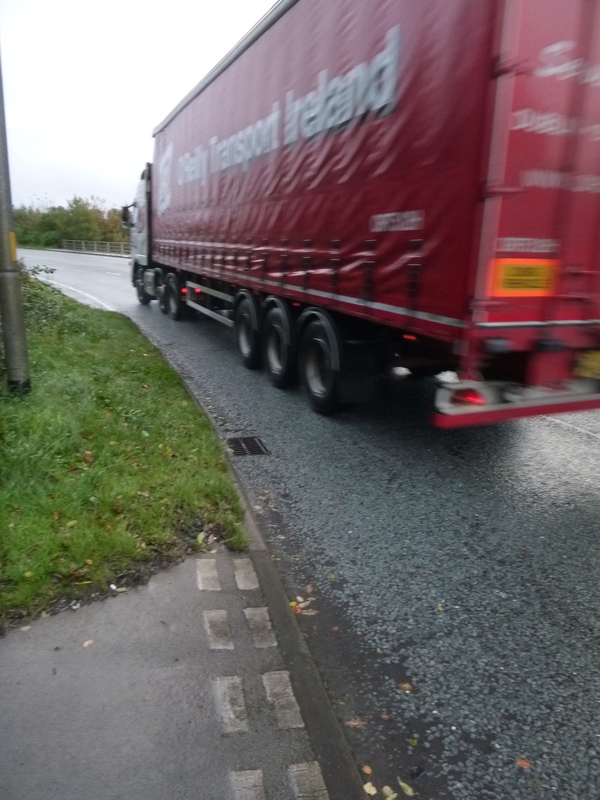 So cycling stays a practice other people – people not from here – do. It’s not seen as something local people do or might do even though seeing it that way would contribute to a different, better, stronger, more sustainable regeneration. 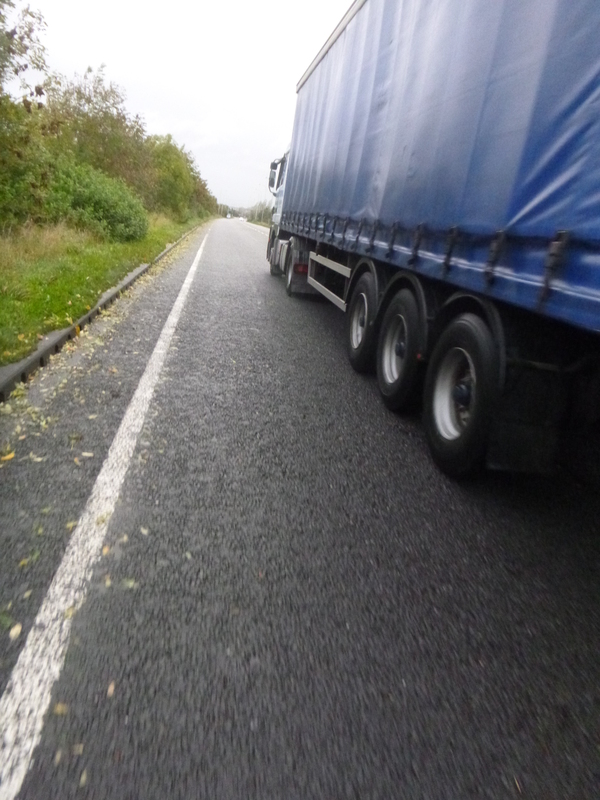 and if cycling’s not normal, these things are hard. 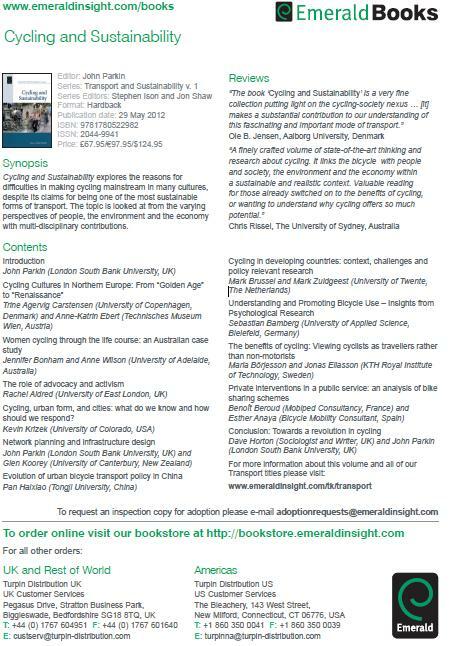 Lack of interest in cycling is inevitable consequence of a social, political, cultural and economic environment with neither cues nor props to cycle. In such an environment it will be mainly privileged people who choose to cycle, perhaps partly to communicate their privilege. 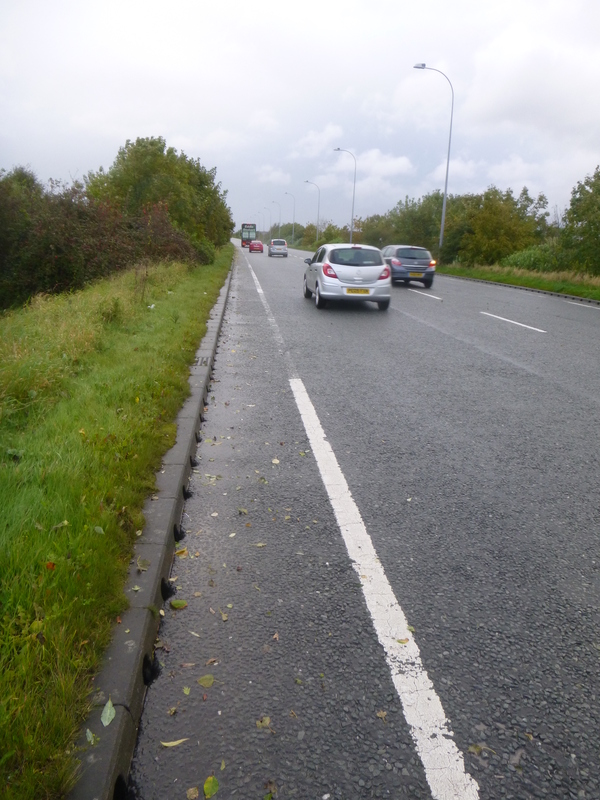 The problem of mass non-cycling is not simply infrastructural, but its solution must be infrastructure-led. 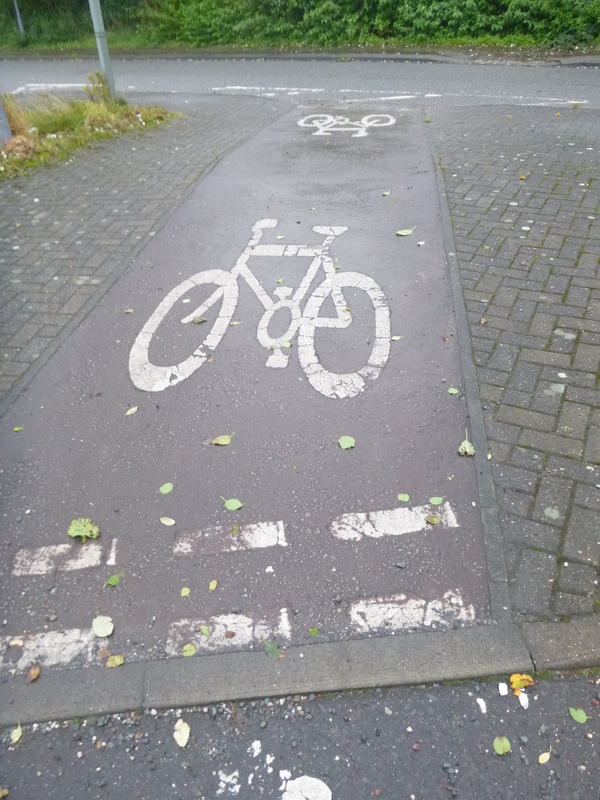 People won’t cycle in numbers if they can’t cycle easily. 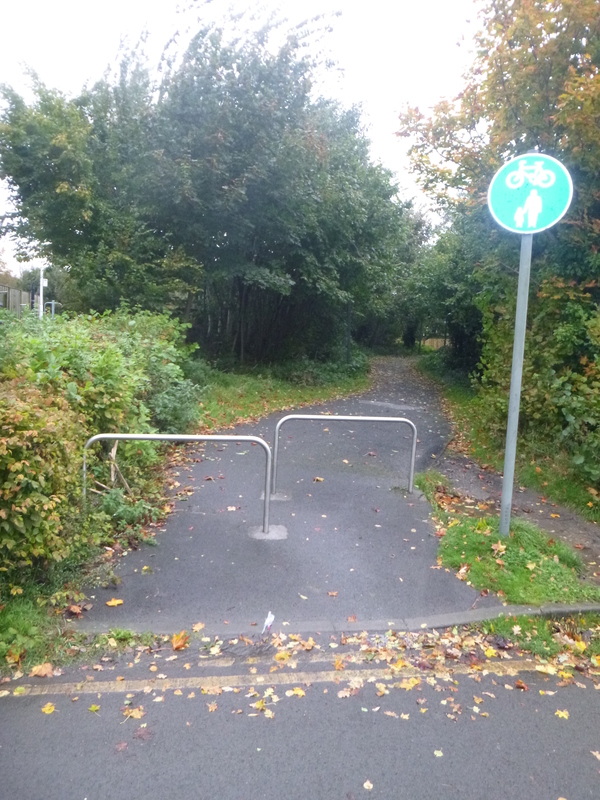 Smooth and wide, the prom is a super novice-friendly cycle route but without a car it’s impossible to reach without riding on roads where cars rule. 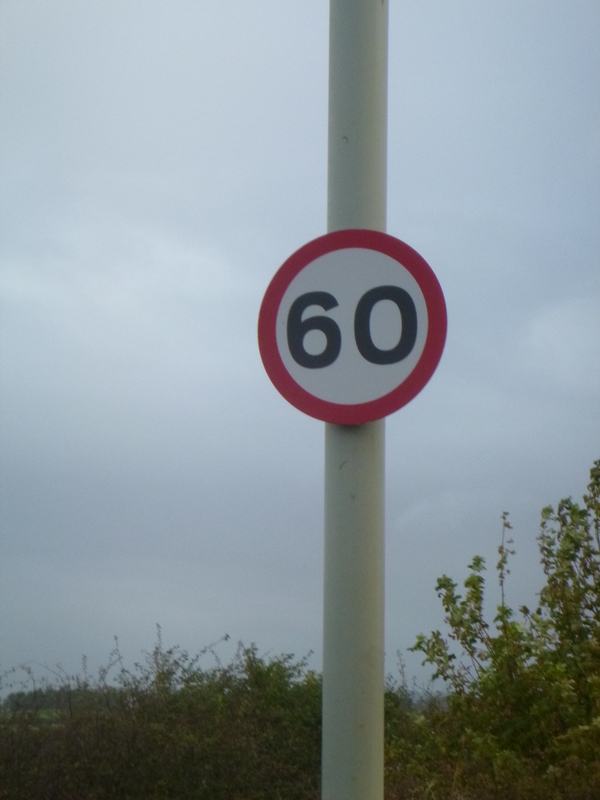 Along the prom sign-posts to other places are excellent, but road conditions in places from which people without cars must ride to the prom are dire. 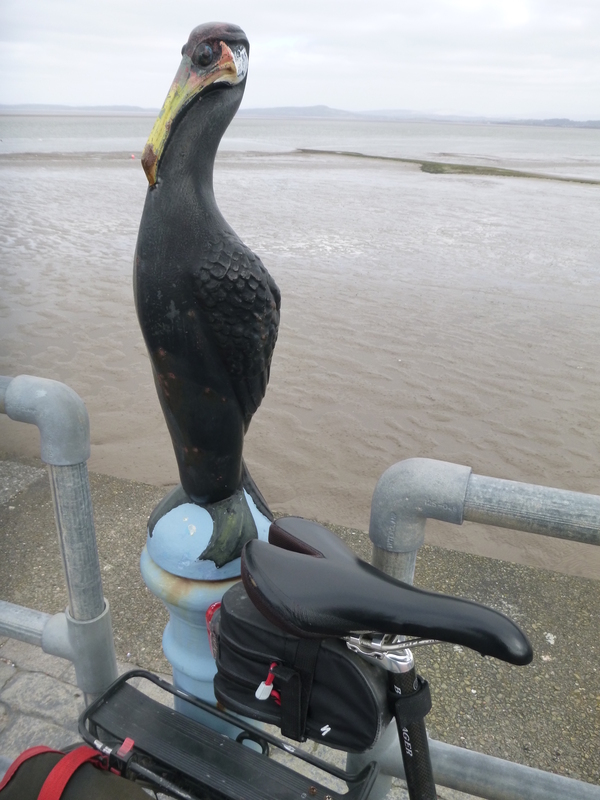 Morecambe’s prom is a slim glimpse of the cycling facilities people want, but like cycling itself it lies on the margin, lining a coast to which birds flock but people don’t. Cycling’s been entertained here because space existed and re-making it for cycling brings tourists, not because it serves the local journeys of local people. 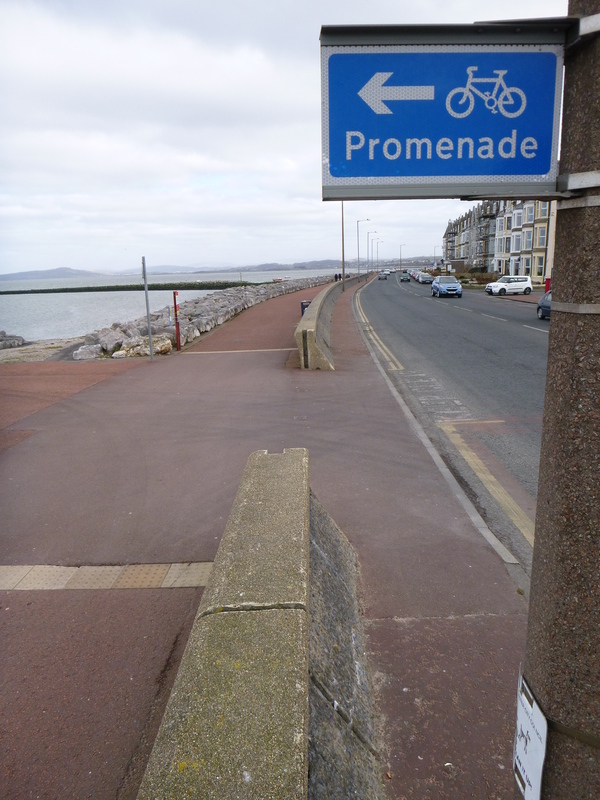 Morecambe prom is a cycling bypass, of both the town and the lives of most of the people who live there. And that’s a pity. Letting cycling onto the prom, it turns out, was only the start. 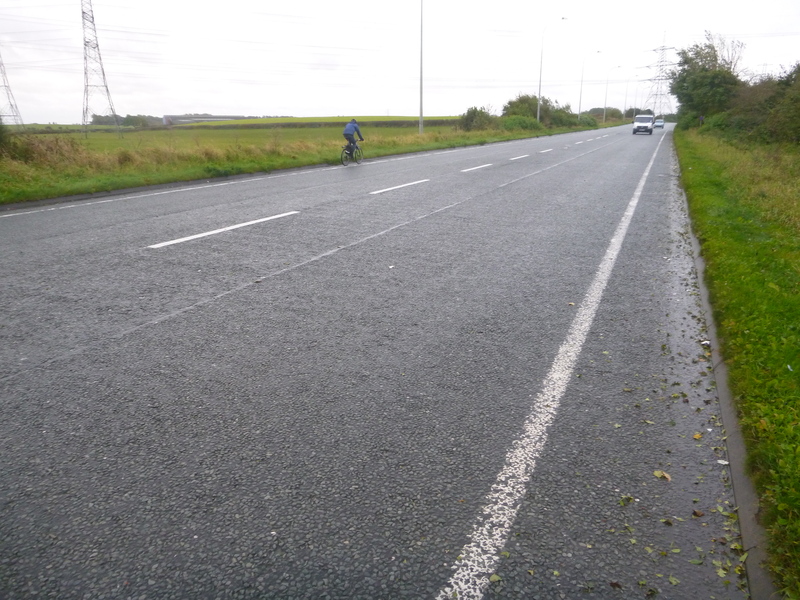 The next chapter involves getting local people cycling here. 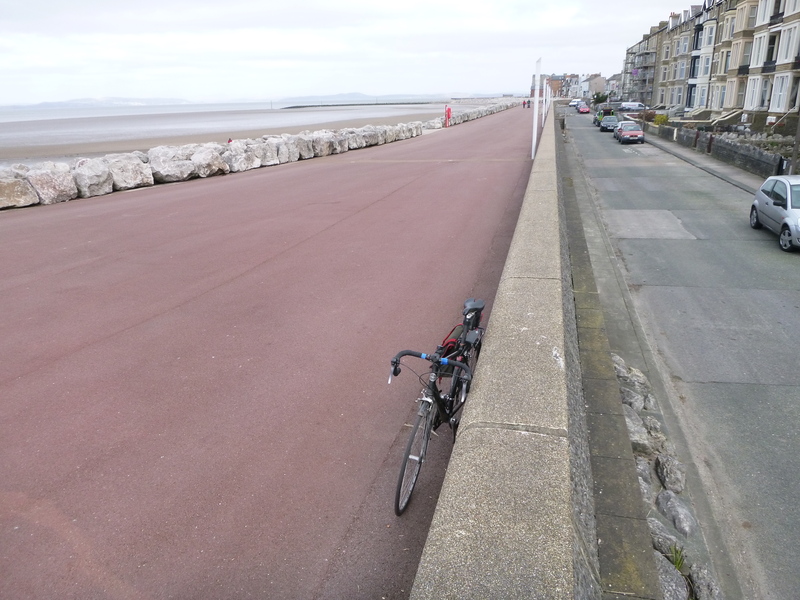 Making Morecambe prom for local cycling would be to follow a bolder, more distinctive path to regeneration; and one which could help the town thrive without depending so much on the tourist potential of its natural setting. 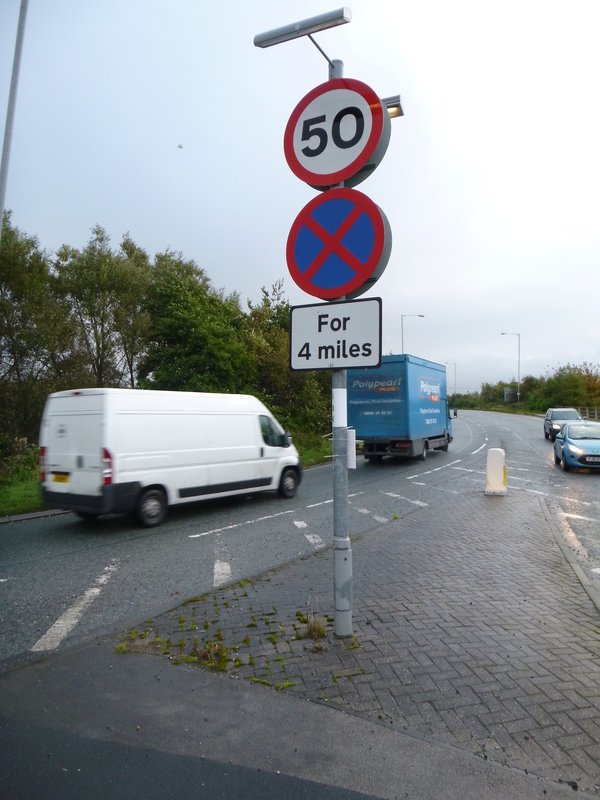 It’d involve re-making the whole town, not just its prom, for cycling. I’m a fairly incompetent and very low in confidence bicycle mechanic. Between us Sue and I manage to keep our family’s growing stable of bikes on the road for most of the year, fixing punctures, changing tyres, replacing cables and fettling with gears and brakes. But our bikes occasionally go elsewhere to be given more fundamental overhauls, and/or to have the kind of work done which we feel less able to do – for example, the bottom bracket of my winter training bike crumbled recently, and I got straight on the phone to Colin Stones, a great local bicycle mechanic we’ve known for years, who collects your machine in his van, takes it away to do the necessary repairs, and returns it to you restored to its former glory. I aspire to be more technically competent however. After all, one of the supposed beauties of bicycles is that they are an appropriate and relatively transparent and participatory technology – because they are easier to understand and maintain than a car, our use of bicycles should be less reliant on outside experts, and more open to the DIY ethic. That’s the theory anyhow. I also predict that as a family we’ll acquire more bikes as Bobby and Flo get older – for example Bobby hasn’t got a mountain bike yet, but I don’t think it’ll be too long before he’s desperate for one (especially if he keeps watching clips of Danny Hart winning the 2011 World Championships downhill on YouTube! ), and then I’ll maybe join him, and so too might Sue and Flo – so we can enjoy off-road adventures together. (Without a car and with most mountain biking venues awkward to reach by public transport, this branch of cycling is probably the most difficult for us to experience.) The more bikes we get, the more sense it makes to take complete care of them ourselves. It’s also impossible to teach Bobby and Flo bike mechanics if I’m no good at doing it myself. Bobby had his Redline BMX nicked from our back garden at the end of last year, but that cloud had a silver lining … the local police invited him onto a bike-building workshop, run by local bike recycling project Pedal Power. Danny from Pedal Power sourced a fantastic BMX to replace Bobby’s stolen steed, and over five winter Thursday evenings, Bobby stripped it down and re-built it himself, finishing not just with a ‘new’ bike, but with knowledge and skills which should serve him well. But he and Flo will need support and encouragement from Sue and me if they’re to develop their bike maintenance and repair skills. Like most kids today, I didn’t have parents who were interested in or knew anything about bikes. The little I know I had to find out for myself. 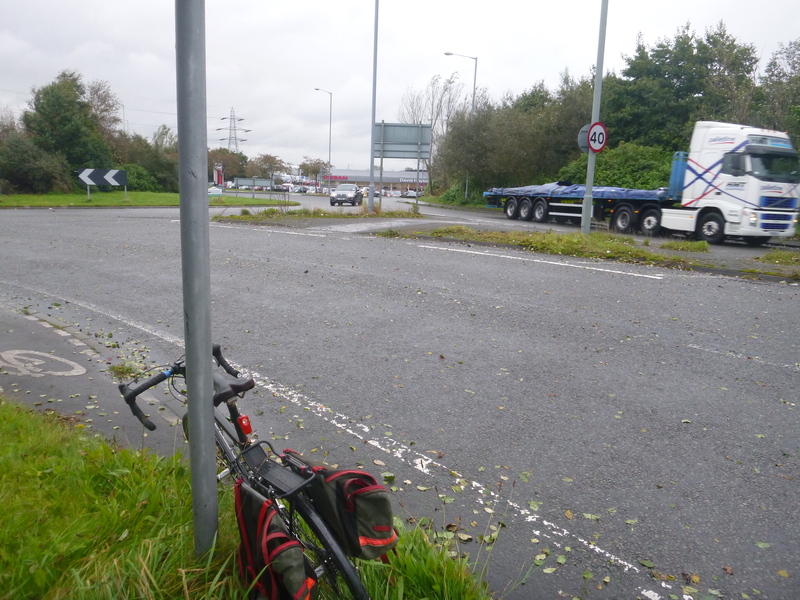 I never messed about with bikes as a kid, and so I never learnt how to look after them properly – I expended my efforts fleeing into the countryside on my bike, and – mainly I think through lack of support – struggled and got seriously frustrated whenever I actually needed to fix it. 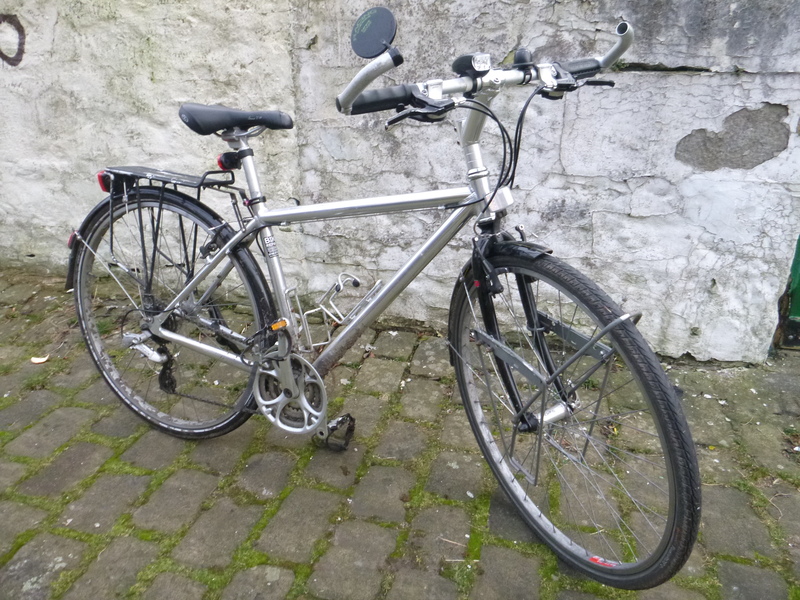 I’ve a partner and a son who are more mechanically minded than I am, we’ve an expanding stable of seemingly ever more expensive bikes, and I’ve a guilty and growing sense that I should develop a technical literacy around cycling to match my reasonable social, cultural and political literacy. So I’ve joined The Tool Club at Freewheelers Bicycle Workshop. Freewheelers Bicycle Workshop is a co-operative enterprise of three women – Aurora, Hollie and Sarah. At the end of a Lancaster terrace close to the city centre, they’ve set up a friendly and airy space with all the tools you need to work on your bike yourself, with at least one of them always around to lend a helping hand should it be needed. In a mature and properly sustainable bicycle system there’d be a place like Freewheelers on every corner. 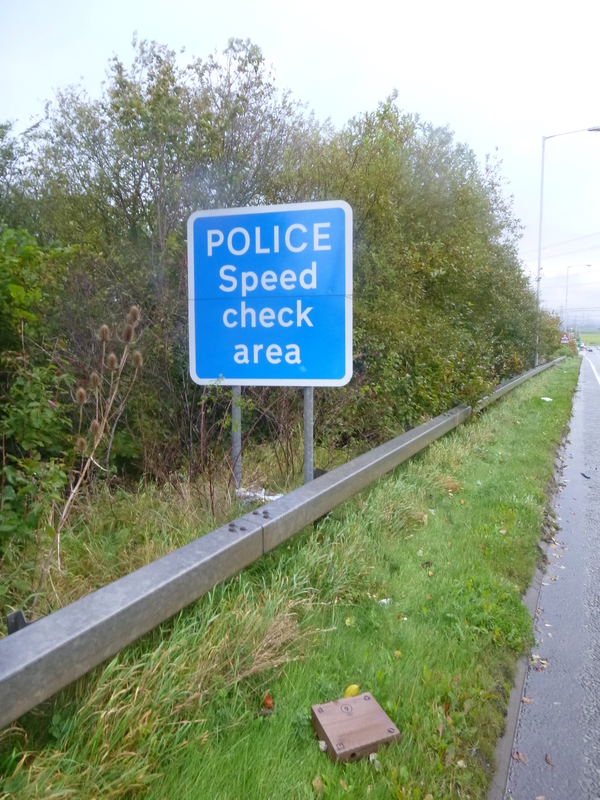 Your neighbourhood, every neighbourhood, would have one. But it is Lancaster’s first. It answers three major barriers to self-sufficient cycling which, aside from what I’ve mentioned already, my own household confronts. 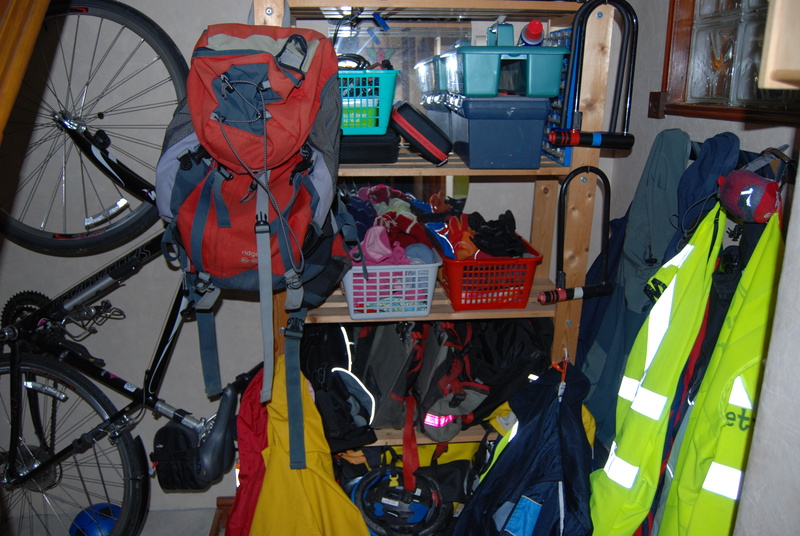 First, a real lack of space to do our own bicycle maintenance; we live in a terraced house with no garage or other out-buildings save sheds with space to store, but not to work on, bicycles. So we work on bicycles in our downstairs dining space, particularly in winter, when it’s too cold and/or dark to do such work outdoors but – because of the harsh riding conditions – such work is also more likely to be required. Second, we lack many of the required tools. Lack of appropriate tools is one reason why we’re happy changing tyres and cables, but balk at removing freewheels and servicing bottom brackets and hubs. Tools for those kinds of jobs can be expensive, and there’s also a vicious circle here – you’re unlikely to buy tools which you don’t know how to use, but you won’t learn how to use such tools until you’ve got access to them, and in today’s capitalist economy that typically means buying them. Third, we lack a more experienced and competent person to call on, when we get to those tricky and potentially very frustrating moments, when we suddenly realise we’re not fully in control of what we’re doing, and could be about to balls it up, sometimes big time. I’m sure it’s true of all DIY, not just bike maintenance, but I have known many times when a supposedly straightforward and quick job rapidly escalates into a panicky, stressed episode and potential mechanical catastrophe. I’ve never owned a car, have always ridden bicycles, already know a fair bit about them, and am strongly committed to the development of bicycle-centred societies. So if all these barriers to bicycle mechanical confidence and competence are true of me, and even accepting that I’m more than averagely mechanically incompetent, how much more true must they be of the majority of the population? 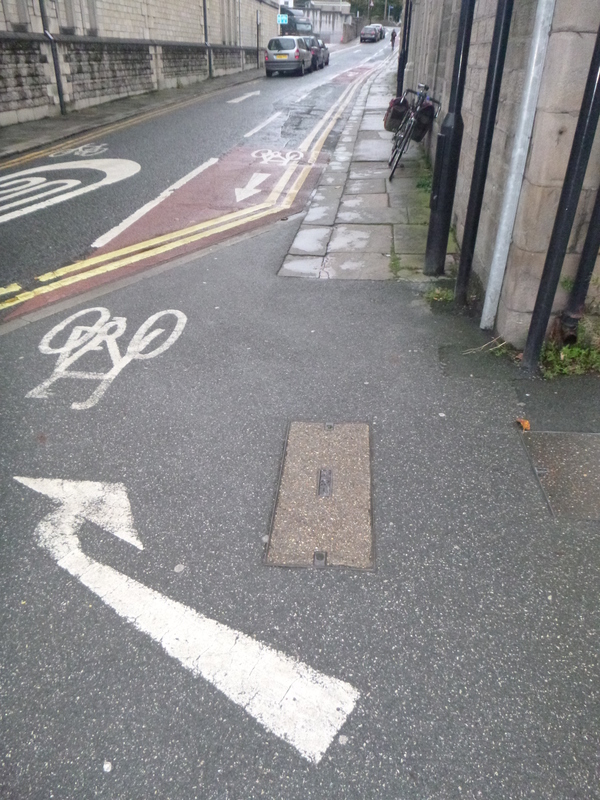 We need better spaces in which people can cycle, we need people to be taught how to cycle, but we also need spaces in which people can learn about bicycles, how they work, and how to repair them. People today know so little about bicycles – even seemingly simple things such as appropriate seat height and tyre pressure, which can make all the difference between enjoyable and excruciating (so excruciating they may never be repeated) experiences. 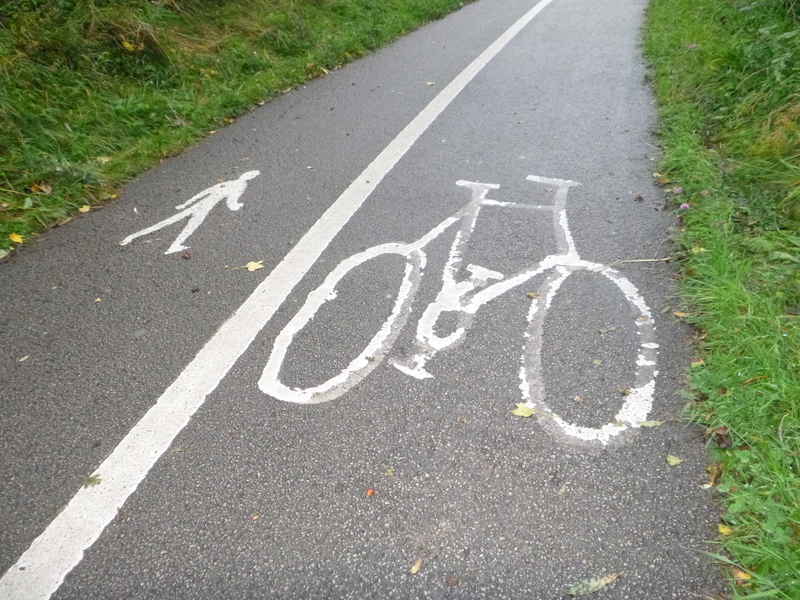 Over the last few generations we’ve lost a great deal of cycling knowledge and skill, and these resources were anyway always already heavily gendered. It is significant that Freewheelers is the achievement of three women. In the UK cycling remains a male-dominated practice, and the cycling industry – including retailing – is similarly male-dominated. It’s so obvious it barely needs saying, but for women to cycle as readily as men (and indeed for many more men to cycle) we need cycle shops and services to which people are attracted and where they feel comfortable, and women as well as men need to be empowered to fix bicycles when they’re broken. For people who do want to be taught how to fix their bike, Freewheelers offers a range of maintenance courses, everything from servicing your bottom bracket (that’s one for me!) 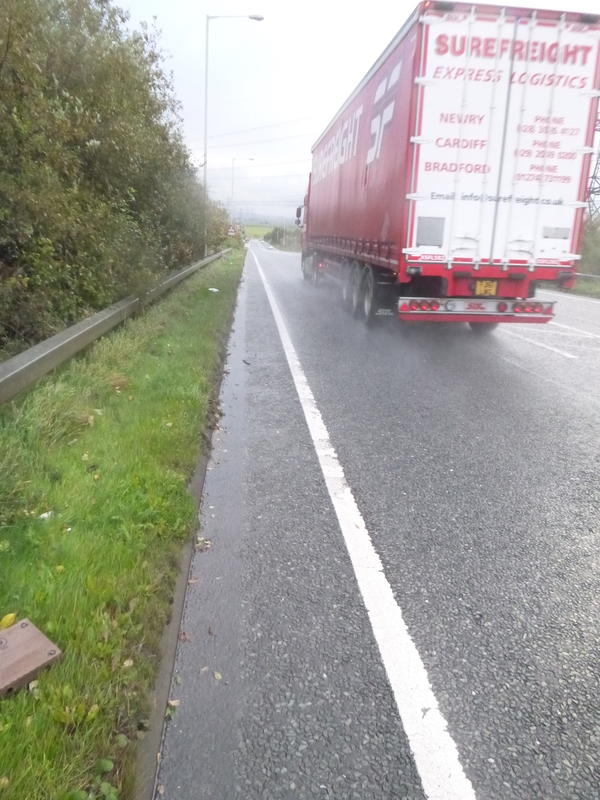 to adjusting brakes, and removing and fitting cables. 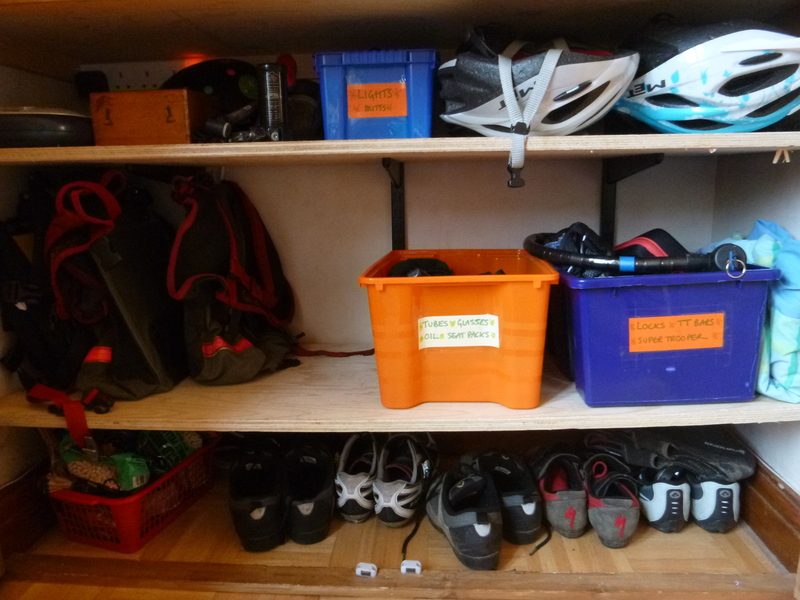 It’s also a bike shop, selling all manner of spares and accessories. And Aurora, Hollie and Sarah also receive unwanted bikes, to repair, recycle and bring them back to life. For the sake of cycling, we need new spaces in which people can learn in safety the vocabulary of cycling and build healthy, active relationships with bicycles. For the sake of a sustainable economy and society, we need these spaces to privilege re-cycling, repair and re-use, and to encourage people to think about, and perhaps to revise, their attitudes to the appropriate relationship between production and consumption – learning how to fix your bike yourself can crack acceptance of passive consumption. For the sake of thriving local community and democracy, we need such spaces where people live, so they can foster face-to-face interaction and contribute to convivial bike-based neighbourhoods. 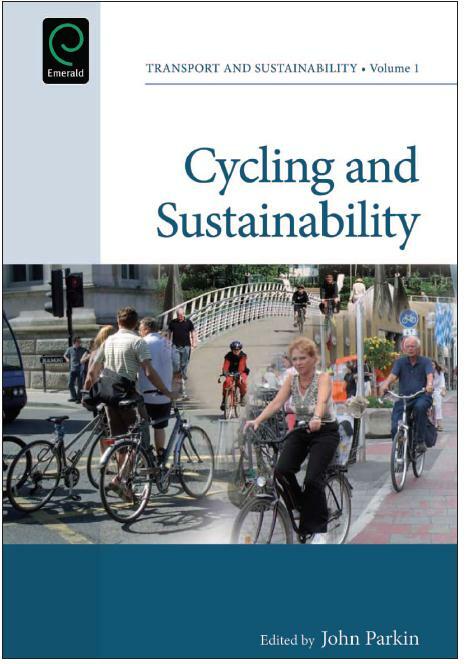 And for the sake of social justice, we need them to be spaces which appeal to and cater for constituencies beyond the current ‘cycling market’, so that new groups have a stake in cycling, and begin to reproduce the bicycle system as something qualitatively and quantitatively bigger and better than it already is. I’m guilty of gross hypocrisy here; I often use on-line cycle retailers because they’re cheap and convenient – I can buy what I want in the comfort of my own home and have it delivered to my doorstep a few days later, and it costs less than buying it from a local bike shop. But each time I use an on-line retailer I’m supporting one kind of bicycle economy and denying another, the kind best represented by Freewheelers, the kind I actually believe in. Aurora, Hollie and Sarah are three women trying to create a space for more people to feel welcomed into and to take up cycling, they’re busy building a core part of a sustainable bicycle system in their own – and my own – backyard, at the grassroots, and they’re hoping – just maybe – to make a bicycle-based living by doing so. But they quite probably depend on people like me siding with them over Wiggle. It’s the same each time I shop at a supermarket rather than the local wholefood co-op; I affirm the wrong kind of world and make the attainment of the alternative I’d actually prefer that little bit harder. It’s too easy for me to do ‘the bad thing’ and too hard to do ‘the good’. But shouldn’t this send a strong signal to me that I need to re-evaluate and re-organise my own life so that doing the right thing becomes easier and doing the wrong thing becomes harder? There are deep structural issues here, which make elevation of the individual’s capacity for agency potentially naive. Certainly, whatever lifestyle changes we ourselves make, there’s also need to push for broader and more fundamental economic, social and political re-organisation. But I think it’s time we start thinking more consciously about not just creating an increasingly bicycle-based society, but the precise kind of bicycle-based society we want to create. And here surely, places like Freewheelers are part of the society we want? 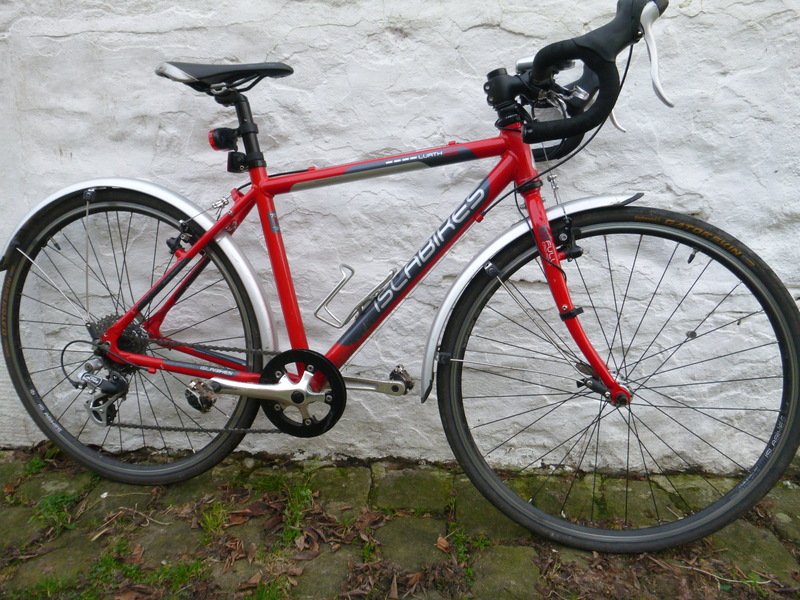 Like more standard bike shops, Freewheelers offers repairs and servicing. To come here you don’t have to get oily fingers; you can simply be a customer, and have your bike fixed for you, albeit – and unusually – by a team of women who have organised themselves and their business cooperatively and ethically, which is a strong enough reason in itself to support them. Freewheelers forms part of a growing grassroots bicycle system which if it spreads sufficiently can re-work cycling as a genuine vehicle of sustainability; not just because cycling replaces trips by car whilst leaving everything else unchanged, but because cycling becomes more rooted in and contributes to a system which is committed to more fundamentally re-organising economy and society, production and consumption, in ecologically and socially sustainable ways. Freewheelers Bicycle Workshop is a new kind of participatory and democratic space, of the kind required to re-skill and re-tool society in convivial and sustainable ways. There are similar workers’ co-operatives and grassroots bike projects elsewhere, such as Birmingham Bike Foundry, Cranks in Brighton, Pedallers Arms in Leeds, and Oxford Cycle Workshop. If there’s such a venture close to you, I urge you to search it out, visit and support it. 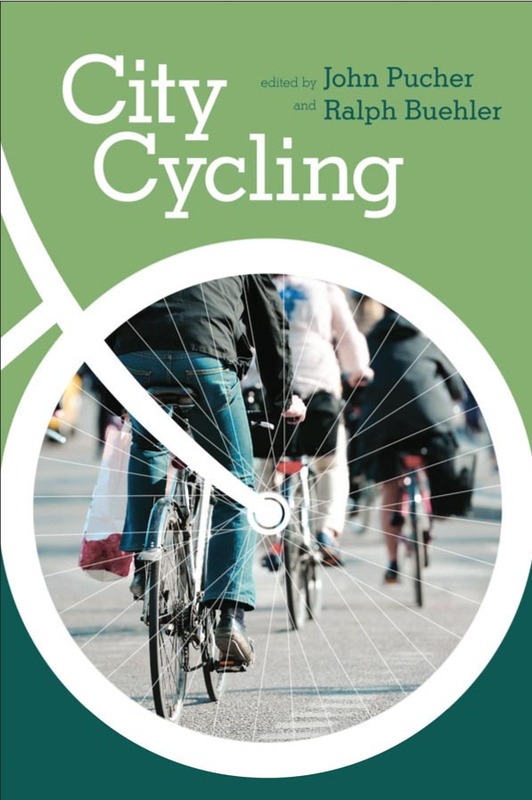 By being not merely about cycling, such places help us see how the push for cycling is no blind push; it’s a push for a fundamentally different kind of society, much better – fairer, greener and more democratic – than the one we’ve currently got. Huge thanks to Aurora, Hollie and Sarah for showing me around the workshop, and answering my questions. And please, if you’re in or around Lancaster, support their co-operative business – and so a truly sustainable future. You can find all the details you need, including opening times and costs of courses, on Freewheelers website.